TRAFFIC on a busy section of the M7 motorway will be asked to drive at just 25kmh this weekend as an overbridge is destroyed as part of upgrade works. 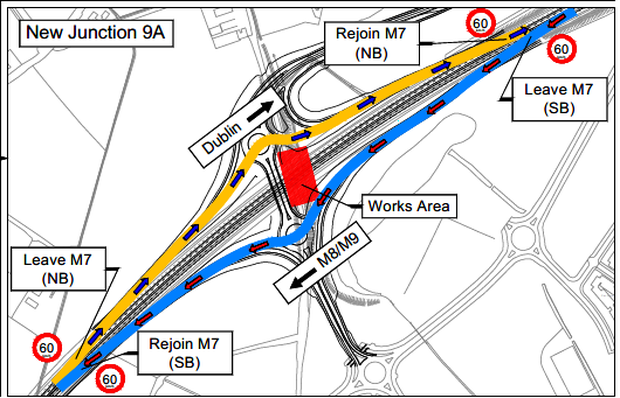 Gardaí said today that road users will be required to use almost-complete slip roads at the Oberstown interchange junction between the Naas north and Naas south exits. It will affect traffic in both directions. “A cautionary speed limit of 25kmh will be in place,” a statement from the garda press office said. However the enforceable speed limit remains 60kmh on the section of road. The demolition of the overpass will take place on Saturday and Sunday with traffic diverted from 9pm on Friday before the work is completed at 6am on Monday. This weekend sees the hurling and football league finals played in Croke Park.